Mr. William “Billy” Pope Barfield, 79, of Dunn died Saturday evening at Cornerstone Nursing and Rehab. He was born in Harnett County on December 1, 1938 to the late Bill and Ruth Pope Barfield. He was preceded in death by a brother, Jerry Barfield. Billy was owner and operator of Automotive Supply Co. for over thirty years. 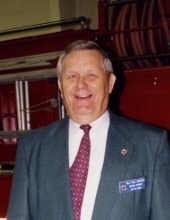 He served on the Dunn Volunteer Fire Dept and retired as an assistant Chief. Billy was a member of Palmyra Masonic Lodge and was a Past Master of the lodge; he was a trustee emeritus with Sudan Shriners of New Bern, a member of Dunn Shrine Club and was a past president. He was a correctional officer for the State of North Carolina for several years. Billy was an active member of the Dunn Chamber of Commerce and, was Man of the Year for 2018. He was serving as a Dunn City Councilman and, was Mayor Pro Tem twice. Billy was active in helping out with the Special Olympics for several years. He was a member the First Baptist Church and was an usher and a past deacon. Billy also played Santa Claus for the last several years in Dunn. A funeral service will be held Tuesday at 11 a.m. at the First Baptist Church by Dr. Len Keever. Burial with Masonic Rites will follow in Memorial Park Cemetery. He is survived by his wife, Annette Barfield, a son, Will Barfield, a daughter, Ruth Hope Morris and husband Ray, a brother, Carey Barfield and wife Rosa all of Dunn, a sister, Peggy B. Churn of Raleigh, three grandchildren, Ashley and Anakin Barfield, and Kimberly Morris. The family will receive friends Tuesday from 10 to 11 a.m. at the First Baptist Church. The family has asked that memorials be made to Shriners Hospital for Children, Attn: Office of Development 2900 N. Rocky Point Dr. Tampa, FL 33607 or to First Baptist Church, 309 West Broad St. Dunn, NC 28334. To send flowers or a remembrance gift to the family of William "Billy" Pope Barfield, please visit our Tribute Store. "Email Address" would like to share the life celebration of William "Billy" Pope Barfield. Click on the "link" to go to share a favorite memory or leave a condolence message for the family.